Come learn more about the 100In1Day global movement at a launch party planned for Thursday, Feb. 21. 100In1Day tasks people to take ownership of their city and together create a better place to live — the concept is simple, 100 urban interventions across Canada in one day, June 1. So, what is an urban intervention? It can be an activity, project or installation that temporarily improves a public space and demonstrates how a community might achieve more lasting positive change. The projects can be practical, like planting trees or pop-up street furniture. They can be social, like hosting a block party. They can be artistic, like ﬂash mobs or yarn bombing. They can challenge us, or ﬁx a problem. They can be big or small. Most of all, they encourage residents to think diﬀerently about their city and how they interact with their neighbours and neighbourhoods. To kick everything off, the launch party on Feb. 21 (which marks 100 days before 100In1Day) invites the community out to learn more about the initiative and see a few examples of potential interventions they can organize. 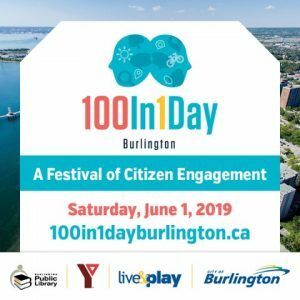 It will be held at the Mainway Arena auditorium, 4015 Mainway, from 6-7:30 p.m.
More details on the global initiative, visit 100in1Dayburlington.ca, and follow the social conversation on Twitter @100in1DayBurlON.